Bradley Wright-Phillips in a jersey commemorating his goal. @NewYorkRedBulls. 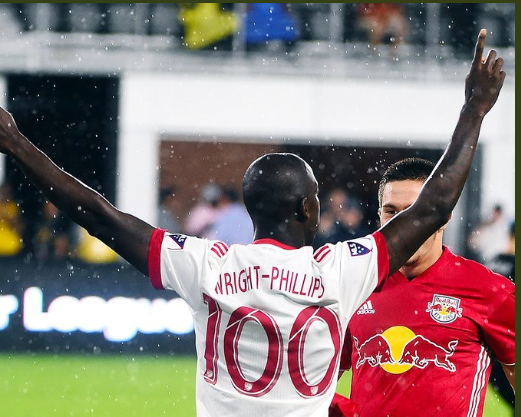 Bradley Wright-Phillips' goal, his 100th in MLS play, was all the Red Bulls needed in a 1-0 win over DC United on Wednesday night. The Red Bulls have now won three straight matches and six of their last seven. The Red Bulls improved to 13-5-2, with 41 points, and moved into sole possession of second place in the Eastern Conference, one point over NYCFC, who plays in Orlando on Thursday night. D.C. United, mired in last in the conference, fell to 3-8-5, with 14 points. Wright-Phillips needed just 81 seconds to tally his 100th career league goal. BWP is now the fastest player in MLS history to reach the century mark, as he hit the mark in his 159th career league game. This surpassed the previous league-record holder Taylor Twellman's 174 matches. Wright-Phillips moved into a tie with Edson Buddle for 10th all-time in league history with 100 goals. It took Buddle 304 matches to reach the century mark. BWP also moved into a three-way tie with Eddie Johnson and Jaime Moreno for 10th all-time in league history for game-winning goals with 26. Wright-Phillips has also raised his career all competitions goal total to 118. Red Bulls goalkeeper and captain Luis Robles needed just two saves to record his 56th career clean sheet. Robles moved into a tie with Donovan Ricketts for 10th all-time in league history for shutouts. Robles has now recorded back-to-back shutouts and this was his seventh overall in 2018. Red Bulls Head Coach Chris Armas improved to 3-1-0 since taking over for Jesse Marsch, and this was his first career road victory as a MLS head coach. Kaku remained atop the league in assists as he raised his season total to 13. New York's No. 10 has recorded at least one assist in three-straight matches and four of the last six games. The Red Bulls return to Red Bull Arena for back-to-back matches, beginning on Saturday, July 28 as they take on Columbus Crew SC. Kickoff is set for 7 p.m.